They say that the first step to overcoming any obstacle is admitting the problem. Truthfully, I never knew a problem existed. It wasn’t until just this last year when I started going to therapy on a regular basis. After several, I mean several weekly sessions with my therapist I finally started to feel a bit more comfortable opening up . Stories throughout my childhood that I never thought to think about before started to spill out of my mouth. Soon I began to realize that my problems lied far beyond just anxiety. Then the dreaded result came out that I had all along been suffering from PTSD. I didn’t want to believe it to be honest. I refused to talk about it with anyone else after I was told. I wanted to so bad but I feared I would be misunderstood. After all, people like me don’t have ptsd. Recently it has been laid on my heart to dig deeper. I want to understand more. So I started to take on the hard work. I’m realizing that this will be a lifelong mission to combat, and that I will always be in battle with it. This is me. This is my life. And I accept that. Because after everything I have been through and the terrorizing thoughts that have gone through my mind, I’m still here. I have looked into the meaning behind PTSD and have found mostly articles written from a perspective that I haven’t really been able to relate to. I’m not a solider or a veteran. I’ve never been to a war zone. I don’t feel like I have any reason to have this diagnosis. I’ve never wanted to compare my situation and why I am the way I am to anyone else but the truth is that I do. I admit that comparison takes me over, all of the time. And I absolutely hate it. But I have been working hard on overcoming that, too. To be diagnosed correctly you need to have at least one symptom that falls in line with every category. For me physiological reactions has been a tell tale sign. Especially when having even the smallest reminder of what hurt me before. Talk about panic attacks. And until about 5 years ago when my health triggered it all, they went overboard. Anxiety is something I’ve always known I had. My mom and sister, and like everyone else says in my family, they have it too. I never thought much into it, or at least I didn’t want to. Never even wanted to talk about it. The thing I am just starting to fully grasp is that all of our anxiety is played out differently in our lives. And most of us struggle with it in one way or another. I have always been the anxious, overthinking, worry wart who always has a stomach ache. (All joking aside). Ever since I can remember anxiety induced nausea has effected my life. We all have different support systems, our bodies react differently, we have different coping mechanisms and our experiences are all very much different no matter how similar we think they are to someone else’s. 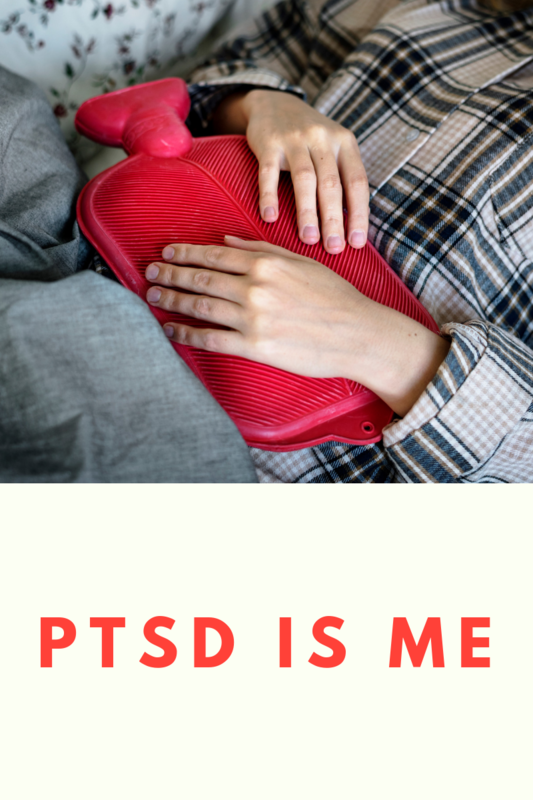 PTSD can create changes in the body when confronted with a person, place, situation, or conversation that brings up any memory of the trauma, and that’s just inevitable. I am determined to find a more comfortable way to live. Individuality is so important to realize when it comes to understanding who you are and what your body is doing. Judging ourselves is only furthering the damage that’s already been done. This is why mental health has become so important to me having lived through it. There has to come a time when we just have to accept what is and have faith in what will be. No one else needs to understand, or even has to. No matter how bad someone wants to tell you that your feelings are invalidated, just know they are always always wrong. We can support one another without having to understand. My husband had been proof of that to me. Do you have thoughts and/or memories that you have pushed away for so long that they have just suddenly disappeared? The memories are extremely vivid when it comes to remembering the traumatic things that have happened in my life. And I think that’s why it’s been so hard for me to express my full story the way I have truly wanted to. I don’t always remember the full story and that makes it harder to get the words out. Which has held me back from ever even wanting to, until I started this blog. Thank god for this blog. My concentration gets easily distracted so writing at my own leisure is a sense of release and control for me. At times I feel like I have complete control and other times it feels like I’m barely hanging on. They say that after a traumatic event takes place that sometimes some will develop unrealistic beliefs about the world, or even themselves. This one really hit me. Being the positive person I am perceived to be sometimes, deep down there is a woman who is in constant battle with herself. And no one else ever sees that. What people don’t know is how bad my thoughts tell me every day that this world is full of danger, and always making me full on aware of it. Stressing me out until I hide away and remove myself. And making me not trusting of very many people. Hyper-vigilance has always had a hold on me. I have cancelled plans last minute because of a “gut feeling”. I’ve refused to make dates after begging my friends to hang out with me, and I literally stress every single night about someone breaking into my home. Every night. and I have never been robbed before. I felt so stupid about it before, but now that I understand it.. I don’t beat myself up as much. This is me. These situations have all left me feeling misunderstood and like no one will ever understand. I have felt like my problems were my own fault for so long that i have full of shame. I can’t even accept myself, let alone accept that others accept me. I want healthy friendships that turn into family. My kids deserve it, my husband deserves it, and I deserve it. I WILL take the work it takes to get there. No matter the cost. Loving myself more and more everyday & accepting who I am has literally been life changing. It feels good to get the poison out of me that’s been tainting my life for too long. Those of us who are suffering need to stop believing the lie that we aren’t good enough because damnit, we are! No matter how many times I was told that I wasn’t, I have to choose to no longer accept it. Not going to the ER for my panic attacks in over a year has been a huge accomplishment for me. I found control in many aspects, but I still have so long to go. It’s our choices and our actions we should be focusing on having control over, or at least do our best to. I never realized how bad my childhood would have affected me. Most things I went through became and were so normal to my everyday life, including my mom and sisters, that we just went about. And we have never spoke about it before, so I will share just a smidge. Truth is, my moms ex husband literally haunts me everyday. He is the reason why I have hated the way I look, the way i walk, the way I talk, and even the way I eat. His thoughts of telling me that I was useless pretty much every day has made me believe that I am. And that was just the emotional abuse. This didn’t include the many times he would cheat on my mom, abuse her, isolate her, and make her feel like we couldn’t live without him. Of course living with him and his two sons since I was 5 months old I quickly began to believe that I was the issue. At least that’s what he wanted me to believe, well that’s how I feel. Everything I said to him was annoying so eventually I just didn’t talk much when he was around, but I found out with time that when I would clean the entire house for him and do all things I could to make him happy, including letting him kiss and touch me in awkward places, he was happy. And when he was happy.. everyone was happy. Anything we could do to keep the fuse longer, we would do. I can’t even believe I’m sharing this and I can’t even imagine how my mom must of felt. We were never allowed to leave, especially when things were bad. He would break windows out of our vehicles if we tried to leave. He broke multiple phones, locked us out of our own house in freezing cold temperatures with absolutely nothing until we were begging for his forgiveness just so we could be warm, or have keys to leave. The he would stalk us, even when we drove over 200 miles to get away from him. And every time he would win us back. I never realized it until recently but we were trapped. I literally thank god all the time for finally pulling us away safely. By the grace of his will, we are all still alive. I knew I needed to make a change in my life when I made my last post about being alone. As I was writing I started thinking about how much I depend on Jordan’s presence. And wondering why the heck I do. The sweet man he is he said “baby, I’m here for the long haul.. I just think your trauma is truly effecting you and you need me to be around all the time. So that’ what I will do”. Although flattering, I’m upset with myself. So I need to admit these things so I can move forward from them. In fact, I’m so afraid of being alone that I panic when he’s getting ready to leave the house. Getting out of the house and interacting with others I don’t know, all by myself never has happened. at least not without major anxiety. I have always just hated to be alone. Abusive relationships can truly be SO traumatic. All of it has effected me and the relationships I have and have had. Not many people truly stick by my side without throwing stones and/or stabbing me in the back which has also made it really hard for me to trust anyone. Right when Jordan got me pregnant I flew off the handle. I did whatever I could to push him away because I was SO scared. I was young and had barely left an abusive 5 year relationship that I still wasn’t over. I was mean, I told him I couldn’t and would never be with him and I did my best to do it on my own. Deep inside I knew what I needed, but it was my ‘reaction’ to not trusting his intentions. I felt at the time like my heart was too damaged to love another person. And I honestly didn’t believe anyone would ever love me. We are 8 years into a relationship and now marriage and raising 3 amazingly beautiful children, and Jordan has seen the worst of me. My health has been through the ringer these last 5 years with several misdiagnosis that led to me not being able to work and him having to quit his job to start his own business. It wasn’t because he wanted to leave his career and why I wanted to quit mine, it was so we could survive. And now we don’t see any other option. He wants a better life not just for himself, but for all of us. Because of this privilege of always having him (my safe place) around, I hate to admit it. But I have noticed that I am only really my happiest when he’s around. And now that I accept that and realize it, I realize that it’s not healthy. I truly want to change this. Whether I make the right or wrong choices isn’t for anyone else to decide because I am doing my absolute best and that should be all that really matters. I can’t tell you today exactly why I am suffering because I feels like it’s a multitude of things. What I can tell and share with others when reading this is that there is hope. Don’t let what others have blind you and keep you from getting the things that you want. Including freedom, peace, love and acceptance. The first step is to put to emotions put your out there to someone you trust. Whether it’s a therapist, your soul mate, a parent or a friend. I haven’t had anyone in my life like Jordan before, ever. He protects me, he loves me unconditionally and unselfishly. He proves that to me every day. I don’t tell him enough, but my life is 100% better because of him. People might say he shouldn’t get the credit for the work I have put into growing myself and who I am, but he has been right behind me. Making sure I don’t fall, every single day. Self growth does does take a lot of individual work, don’t get me wrong. But, I know I wouldn’t be right where I am today without the support and love from him and our kids. He doesn’t get enough credit for what he has done for me and for our family. I know his dad would be so proud of the man, father, and husband he is. Because of him I have finally had the courage to open about all of these things. And maybe help open the door of realization for someone else. Sometimes all it takes is talking with someone else who understands you to feel like you are human again. That’s why the thought of community is so important to me. Its your story that can change the life of another human. No matter how and where you tell it, Even if you only share it with one person or the world. You have the courage and it’s found within admitting the problem first. You own the rights to everything that’s happened to you, no one else does. PTSD is me, and I for the first time can faithfully say that I accept that part about me. I’m not perfect and I never will be. But I will always strive to be better than the person I was yesterday. Do you have or know someone who is struggling with a mental health illness? If you are the one struggling, I highly encourage you to say thank you to your loved one who supports you the most. If you know someone who is struggling with a mental health illness then I highly encourage you to give that person a hug and tell them you are there for them and they aren’t alone. Your encouragement and support can change their life. Thank you for writing such a raw and accurate description of PTSD for those of us who are not Vets or have survived a single tragic event. It’s hard to wake up in the morning feeling cloudy and unease and then compare yourself and say, I have nothing to complain about, I didn’t go to way. I didn’t see those horrible things. But we need to remember that a constant state of stress changed how our bodies respond to everyday normal things. I feel the most normal when everything super busy. Then when the calm hits, my panic sets in. The stress hormones haven’t leveled out yet. I’m teaching my body to stop preparing for me fight off the next Bear attack as my therapist says. Hang in there. We’re all in this together. Thank you so much for taking the time to read my experience and to comment your thoughts. It means so much to me! It’s so important that we understand one another so we that we don’t feel so alone when going through new things. Trauma is so much more than what society thinks it is and it’s why Mental Health has become so important to me. I understand the way your explaining how you feel so well. Have you ever heard of EMDR therapy? It hasnt made things go away, but it has made things better for sure.